How does this differ from Pensacola State College? We are part of the Department for Workforce and Economic Development at Pensacola State College (or Pensacola State College). It is our mission to take the tremendous job that Pensacola State College does and apply it to the Pensacola Bay area workforce. In academic terms, we deliver non-credit classes that are part of professional continuing education. In corporate terms, we are an out source for corporate training, and we’ll deliver training anytime, anywhere. How are we the same as Pensacola State College? We’ll work with you to build a Corporate College, credit classes delivered at your site. We facilitate discussion between your HR and Pensacola State College faculty, and build a program that not only create more valuable employees, but begins their journey to a college degree. Our training programs are designed to provide the skills that companies need to excel. We offer both open enrollment and customized training programs which can be delivered on your schedule and at your desired location. It is our mandate to provide workforce education in a format that is easy to access and learning-centered. In order to make the best option available to you, we offer virtually any option. We can deliver any training in any format at any location. No kidding! This option is very simple. We offer certain courses on a set schedule at different Pensacola State College campuses. Individuals sign up and attend class, much like a traditional college format. This option typically offers the lowest course fees. Only a small percentage of the classes that the Pensacola State College Institute has to offer are delivered this way. We work to create a special program that delivers traditional Pensacola State College college-credit classes at your work location. The Center for Corporate and Professional Development Training Centers works to liaison between your company and Pensacola State College department heads to create certificate programs that are right for your employees. This is a great way to start employees on the road to a college degree! Any class that is in our catalog, at any location, at any time. And if we don’t currently offer the training that you are seeking, we will dive into the deep resources of the national community college system to find it. In a nutshell, we are willing to work with you to find a training delivery method that meets your work schedule and budget. Contact Ruth McKinon at 850-484-1363 or rmckinon@pensacolastate.edu for more information. Use the link below to browse our current course offerings. A minimum enrollment for each class is required for class to be held. If you do not see what you need, contact Ruth McKinon at 850-484-1363 or rmckinon@pensacolastate.edu for more information. A minimum enrollment for each class is required for class to be held. Online registration is available to everyone. Click Here and then follow the instructions on the Pensacola State College website always choosing Continuing Education. Mail your completed Continuing Education registration form, with payment information (do not send cash) to: Pensacola State College Cashier Office, 1000 College Blvd., Pensacola, FL 32504. Students with special needs must notify the Center for Corporate and Professional Development Training a minimum of two business days before the course start date so appropriate accommodations can be arranged. Walk-in registration: 8 a.m. – 4 p.m. Monday–Thursday Web registration: 12:01 a.m. – 8 p.m. Monday–Thursday Weekend web registration: Midnight Thursday through 8 p.m. Monday Mail-in and night depository registration: Available at all times The college offers extended hours during college credit registration. For more information call (850) 484-1600. Continuing Education students need parking decals for their vehicles. Take vehicle registration and student ID or class registration to the Pensacola State College Police Department located in the Student Center, Building 5, Pensacola campus; Building 4000, Milton campus; Building 3600, Warrington campus. To receive a refund for a course, students must withdraw prior to the second scheduled class meeting. For workshops, conferences, seminars and special training programs, students must withdraw prior to the first scheduled class meeting. Call (850) 484-1374 to drop a course. Refunds are not processed for tuition of $5 or less. Education to Go offers a wide range of highly interactive courses that you can take entirely over the Internet. All of their courses include expert instructors, many of whom are nationally known authors. At the Ed2Go site, search for the course by title. Once course is located, click on enroll or add to cart button. At next page, select the appropriate option. Select create an account if this is your first online course through Ed2Go. If not, use the returning user option. Once your account has been created or you have signed into your account, complete the Ed2Go registration process. You won’t make any payments to Ed2Go. After registration is completed, a notice will be sent to the Center for Corporate & Professional Development Training to verify payment of the course. After verification of payment, you will be able to access your course on or after the designated start date. Students may register at any time during the semester for an online Real Estate course. OLT was established in 1997 to develop and distribute professional education products via the Internet. Our range of products extends from virtual pre-licensing courses to online drills and practices. OLT partners with insurance companies and colleges to cater to their training needs. All of the OLT training products are interactive and use the latest Internet technologies. In addition, OLT works with its clients and partners to provide the best virtual training environment possible. Students may register at any time during the semester for an Online Training class. 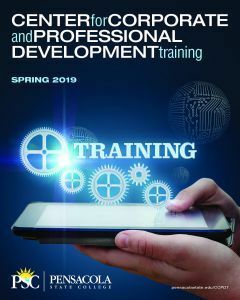 Please visit http://www.oltraining.com/fl_pensacolastate/index.php for complete course information. Pensacola State College, in partnership with Gatlin Education Services (GES), offers online open enrollment programs designed to provide the skills necessary to acquire professional level positions for many in-demand occupations. Gatlin classes are facilitated by an instructor. You may register for these classes at any time during the semester. Please visit http://careertraining.ed2go.com/pensacola/ for complete course information. 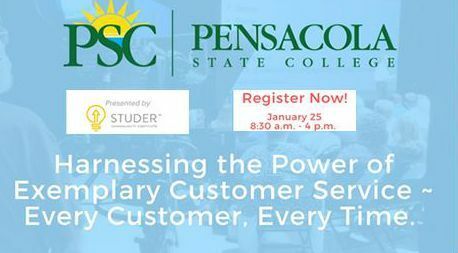 Register with Pensacola State College. Walk in: Pay in person at the Pensacola (Ninth Avenue), Warrington or Milton Campuses. Pensacola State College will notify Gatlin that you have completed the registration process. Gatlin will then contact you with all of the necessary information to take the course. Pensacola State College inhabits 3 campuses in Escambia County and one campus in Santa Rosa County. Pensacola State College leadership believes strongly in the strength of the local economy and its potential for growth. In order to best reach that potential, Pensacola State College believes that community partnerships are essential to attract businesses and permanent residents. The Department of Workforce and Economic Development (WED) is Pensacola State College’s commitment to that goal. WED is responsible for seeking out, developing, and growing partnerships in the community that will attract businesses, expand opportunities for residents, and ultimately create a better way of life for everyone in Northwest Florida. The Pensacola State College Institute for Corporate and Professional Training is an important piece of that effort. The Institute provides opportunities for skilled workers and professionals within local organizations to take their career to the next level, either through our ongoing courses or by locating education at worksites and offices. This has three economic impacts. One, readily available training and continuing education is one of the primary factors that companies look for when considering relocation. Two, our programs create a more highly skilled and qualified workforce, a second priority for retaining or relocating companies to the Pensacola Bay area. Three, the availability of this education encourages individuals that this is a place they want to live and grow. Pensacola State College is committed to making a growth impact on the economy of the Pensacola Bay area. It is actively seeking to support and partner with other organizations committed to the same goals. This action may take traditional educational roles. It may also mean something new and exciting! To explore the possibilities, talk to us today. Shouldn’t your company be next?